de Havilland DH.104 Dove c/n 04079 ZS-BCC "Katberg"
In the South African Airways Museum Society aircraft park at Rand Airport, Germistion. The de Havilland DH 104 Dove, de Havilland’s first post-war production aircraft, was developed to replace the de Havilland DH 89 Dragon Rapide. Development began in 1944 and the aircraft was of all metal construction with a semi-monocoque fuselage structure covered with a stressed aluminium skin. It was the first British transport aircraft with tricycle landing gear. Two supercharged 330 hp de Havilland Gipsy Queen 70-3 engines with three blade, DH Hydromatic fully feathering and reversible propellers were mounted on the low-set, metal covered cantilever wings. Seating was initially provided for eight passengers. Two cockpit crew sat in the distinctly de Havilland raised cockpit. The prototype (G-AGPJ) made its first flight at Hatfield airfield, Hertfordshire on September 25, 1945. Production of the Dove, including the RAF version known as the Devon and the Royal Navy aircraft as the Sea Devon, totalled 544 aircraft, including the two prototypes, and continued until 1967, the last delivered as late as 1970. By this time the aircraft was a product of Hawker Siddeley. The type saw widespread service, examples being sold to over 15 countries for both civil and military use. 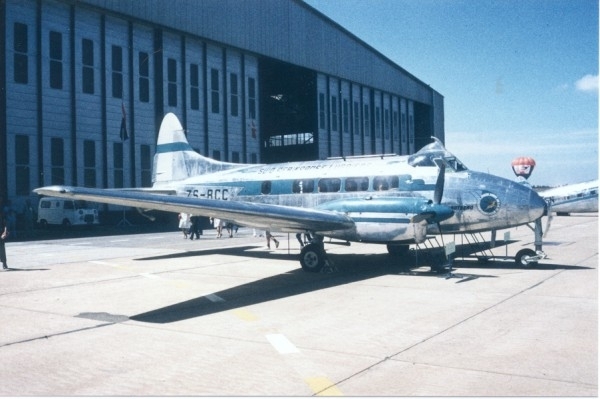 South African Airways purchased two of these eight-seat British-built aircraft for use on the proposed feeder services in South Africa This scheme never materialised and they were briefly used for communication duties on the route to Mozambique before being sold in 1952. The first service for ZS-BCC was flown on 8 March 1948 when it operated Palmietfontein-Kimberley-Upington-Karasburg-Keetmanshoop-Windhoek. The Dove’s last service flight was from Lourenço Marques (Maputo)-Palmietfontein on 30 October 1951. 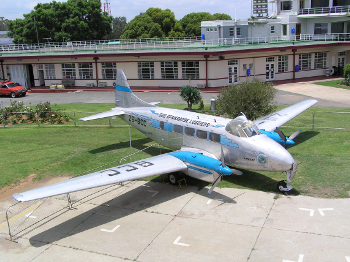 The Dove was sold to Northern Rhodesia Air Services on 31 January 1952 and departed on 18 March 1952. It was registered VP-RCL. The registration was later changed to VP-YLX while still with NRAS. The next operator was Mines Air Services with the registration 9J-RHX dated 15 February 1968. After a brief stay with MAS the Dove was exported to Fairey Surveys at White Waltham west of London and registered G-AWFM on 24 April 1968. The Dove was sold to Fairflight, a charter airline operating out of Biggin Hill, and was used as a source of spares. 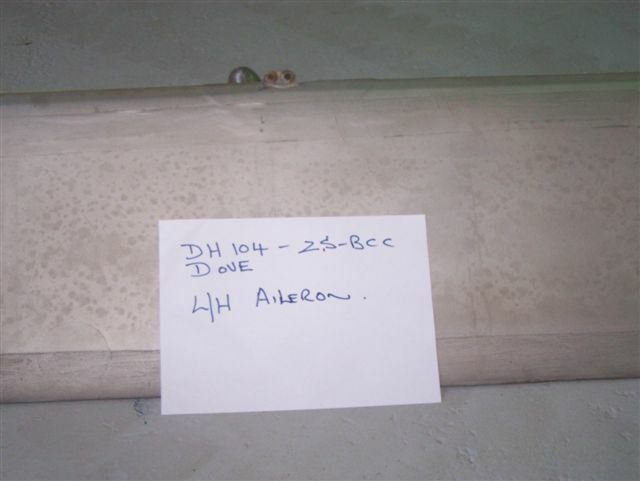 With the help of the late Alan Bell, Hawker Siddeley made a donation of £500 for the purchase of the remains of the Dove. The Dove was disassembled and moved to Salisbury Hall, the home of the Mosquito Museum, for storage. 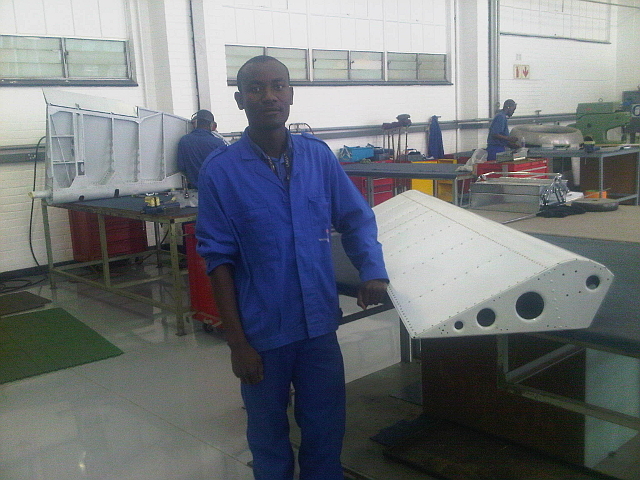 The first sections left for Johannesburg in the cargo hold of an SAA 747 before being restored by the SAA apprentice school. 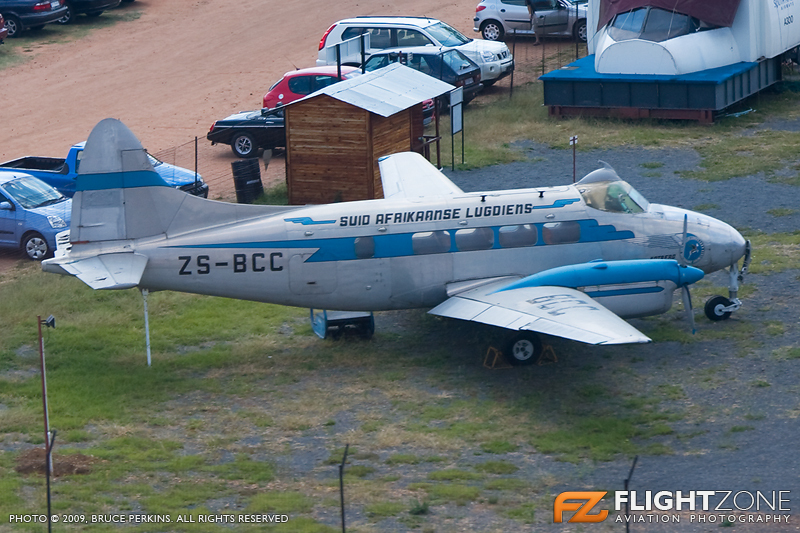 The aircraft is now part of the SAA Museum Society collection at Rand Airport and wears post war livery. Reproduced from SAA Engineering Staff Aviation Technicians Bulletin SATech./SATeg No 14 of March 1979. On 12 February 1979 an aircraft (or at least parts of it) arrived back in South Africa, some 27 years after leaving these shores. The aircraft is G-AWFM, a de Havilland Dove, which saw service with South African Airways as ZS-BCC, and was brought back to Johannesburg with the help of generous donations by Hawker Siddeley Aviation (now part of British Aerospace), Dunlop and Goodyear. After World War 2, the sole responsibility of providing air transportation in South Africa Was vested in SA Airways. The then Minister of Transport F.C. Sturrock, instructed that SA Airways evaluate all available aircraft types for use on feeder or secondary routes. After much consideration, the DH Dove was found to be the type best suited to the airline’s needs. Two aircraft ZS-BCB “Naval Hill” (04009) and ZS-BCC “Katberg” (04079) were acquired in November 1946 and December 1947 respectively. Services were operated between Johannesburg and (the then) Lourenco Marques, and a route pioneered between Durban and Bloemfontein via Kokstad and Aliwal North. Air transportation was thereby provided to the eastern central part of the country. The policy regarding feeder services changed towards the end of the decade, and responsibility was transferred from SA Airways to private enterprise. 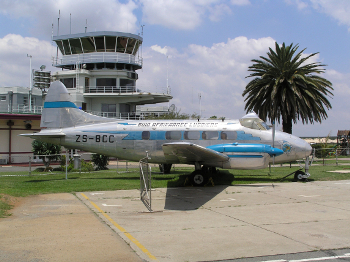 ZS-BCB, having cost £17927 and been in service from 23 May 1947 to 30 March 1950, was sold to the South African DCA (Department of Civil Aviation) as ZS-CAG for £11000. It eventually found its way back to Britain where it flew with a number of operators as G-AOVY. It was broken up for spares in 1968. ZS-BCC was originally ordered by Skyways Ltd. As G-AJOU on 17 April 1947, but was subsequently sold to SA Airways for £18352. After a test flight on 25 November 1947, it was handed over on the 28th. The aircraft left London on 5 December 1947, and during the extended delivery flight, called at Paris. Dijon, Geneve, Rome, Malta, Tripoli, El Adem, Wadi Halfa,’ Khartoum, Juba, Kisumu, Tabora, Ndola and Salisbury en route to Palmietfontein, where it arrived on 14 December 1947. It operated its first service from Palmietfontein on 8 March 1948 to Windhoek, via Kimberley, Upington, Karasburg and Keetmanshoop. Former Chief Executive Jim Adam remembers that the aircraft was also used on VIP flights, transporting the then Chief Airways Manager, General Venter, and other senior officers, as well as for urgent missions. Utilisation was, however, very low. And when ZS-BCC operated its last service from Lourenco Marques to Palmietfontein on 30 October 1951, it had only 307 hours “on the clock”. It was sold for £18000 on 29 January 1952, and delivered as VP-RCL on 18 March 1952. 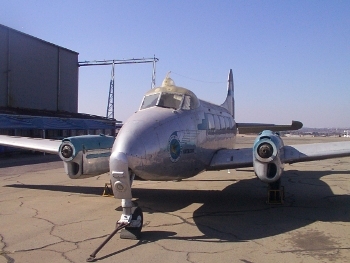 It was operated by Northern Rhodesia Aviation Services, but some sources show that the aircraft also belonged to Anglo-American at one time. It was registered VP-YLX on 27 February 1955 (1573 hours) and became 9J-RHX on 15 February 1968 with Mines Air Services. On 27 March 1968 it was acquired by Fairey Surveys as G-AWFM (7145 hours), and modified for use in photographic surveys. There is a large camera hatch in the aft cabin, and the cockpit top is also non-standard. 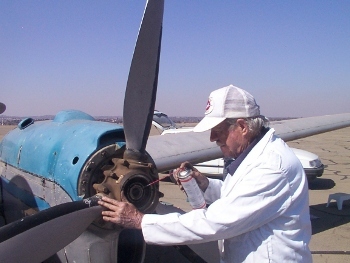 The aircraft flew with SA Airways as a series 1, but was subsequently modified through a series 2 to a series 6, the main changes being increased weights and higher speeds. During its time with Fairey’s, G-AWFM’s logbook shows such destinations as Ajaccio, Tripoli and Jeddah, whilst its home base was White Waltham airfield near Maidenhead, Berkshire. The aircraft was bought by Fairflight Charters in June 1975, and ferried to Biggin Mill on 11 June. This was to be its last flight, having completed 9518 total airframe hours. The availability of the aircraft came to notice at this time, and enquiries were made regarding possible purchase. 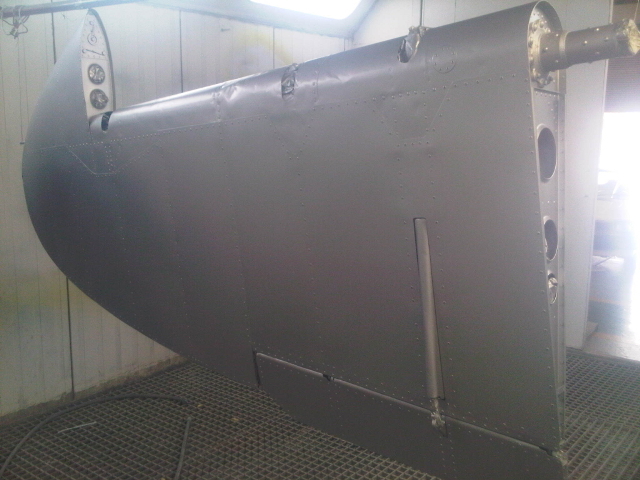 The asking price of £3000 was clearly too high, and gradually the aircraft was stripped of usable parts. In January 1976 it was finally withdrawn from service, and parked in the open. The aircraft was then offered to SA Airways, and it was acquired as mentioned earlier. Hawker Siddeley Aviation’s involvement stems from the fact that de Havilland Aircraft, the aircraft’s original manufacturer, became part of Hawker Siddeley during the 1960s. Mention must be made of the unfailing efforts of Brig. S. van B. Theron and Mr. Allan Bell of Hawker Siddeley’s Johannesburg office, as well as Messrs. Pat Ryan of Goodyear and Harry Pilkington of Dunlop. Transportation to South Africa was the next hurdle to be overcome. Shipment by sea was the obvious solution, but preparation and crating charges proved prohibitive. Shipment by air was next looked at, but approaches to Tradewinds (CL-44 swing tail freighter) and Lufthansa (747F) were unfortunately unsuccessful. The only alternative was the dismantling of the Dove for it to be accommodated in “conventional” aircraft. 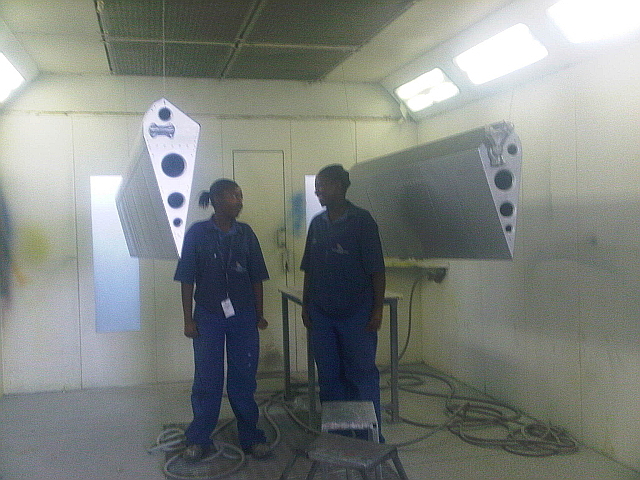 Preparations were made, manuals consulted and every conceivable item of tooling that would be required, collected. Reproduced from SAA Engineering Staff Aviation Technicians Bulletin SATech./SATeg No 15 of April 1979. At 02h00 on Monday, 16 October 1978, Johann Prozesky, Koos Coetzee, Roger Overton and Joe Schlebusch arrived at Heathrow after a not uneventful flight by British Airways. 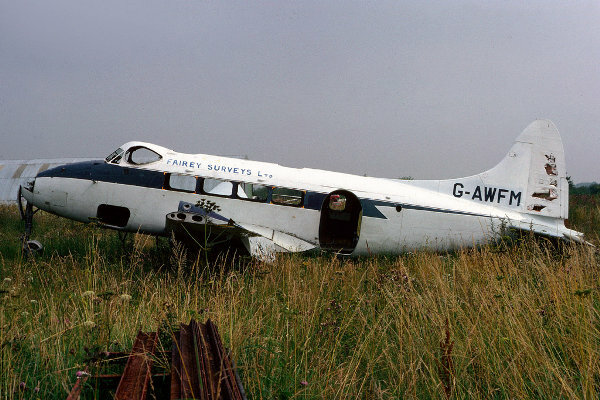 Upon arrival at Biggin Hill, it was found that G-AWFM had literally and figuratively been put to pasture, with deflated main wheel tyres and weighted low down with concrete blocks. To everybody’s surprise these tyres inflated easily after 30 months in the open, and the Dove was pulled onto hardstand. The aircraft had suffered considerable damage, apparently at the hands of youngsters attending the annual Biggin Hill Air Fair. As the nose wheel was missing, the aircraft would have to be towed tail first, and the rudder and horizontal stabilizer were removed. Fairflight’s Land-Rover was more accustomed to towing Doves with a tow bar attached to the nose wheel, but in the case of G-AWFM (or “Wanted for Murder” as it was known at Fairflight’s), it was shown that the job could be done the other way around as well! 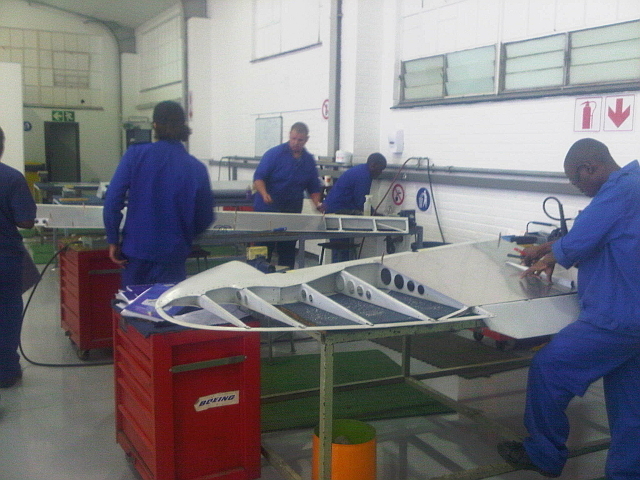 The first objective was to separate the cockpit and fuselage at a production join forward of the main plane, and this was achieved by Tuesday lunchtime. Initially the recovery team was very conscious of the obvious amusement it was affording the Biggin locals, but as time went by and work progressed, this feeling changed to one of admiration. The occasional visitor also stopped by to enquire about the project. The tail section presented no real problem except for a sizeable rodent’s nest that had to be removed. The separation of the port main plane initially had everybody guessing, until it was realised that G-AWFM differed from the Manual, in that the wing bolt and washer were integral instead of separate. Thereafter progress was steady, and the remainder of Wednesday was spent in removing as many unwanted bits and pieces as possible (to reduce mass). Two other Doves are lying derelict at Biggin Hill, and permission was obtained for the recovery of items required for “WFM”. On Thursday afternoon, a 40-foot container truck arrived, and within an hour, everything was on board. This had to be done manually, except for an empty 220 litre oil drum, but, as the saying goes, “’n Boer maak ’n plan”. Truck driver Tony Smith assisted of his own accord, and later took Joe Schlebusch (riding in the cab with him) on a Cook’s tour of London. The initial storage place for G-AWFM was to be to the north of the city, which meant either a direct journey through the afternoon rush hour traffic, or a devious route around the city. Undaunted, Tony selected the shorter route and Roger Overton had a battle to keep up with him as he showed Joe the Oval, Vauxhall Bridge, the Houses of Parliament, Park lane, Lords and the RAF Museum at Hendon. After two hours, Salisbury Hall in Hertfordshire was reached. This stately house was used during the Second World War for the design and construction of the prototype Mosquito, there being concern that the nearby Hatfield would be more susceptible to enemy bombing raids than an outlying, mansion. A group of enthusiasts recently formed the “Mosquito Aircraft Museum”, and the prototype Mosquito, as well as other de Havilland aircraft, have been obtained, and are displayed together with many other historical items. Salisbury Hall is off the A6 road between Barnet and London, Colney, and is well worth a visit during the summer months. Here the bits and pieces of G-AWFM were stored, whilst deliberations were underway to find the most convenient way of shipping it by air. SA Airways scheduled cargo service only goes as far as Paris and ground transportation would be costly. Luxavia were thinking of having maintenance work done on LX-LGT (ex ZS-SAF) in Johannesburg, but later changed their minds, and Lufthansa initially thought that they would have spare freight capacity on their new 747 SCDs over the Christmas period, but for various reasons, all-passenger aircraft were used, and that was that. S. A. Airways freight man in London, Barry Soper, had been convinced that he could move everything bit by bit on a space available basis, provided they were positioned closer to Heathrow. 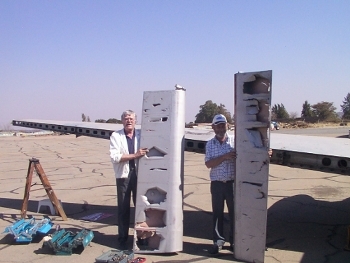 On 9 February 1979 Dave Ackerman, Carel Gronum John Ikking and Johann Prozesky arrived at Salisbury Hall to separate the outer wing sections from the inner, and to split the centre fuselage section into two. Working in the open under freezing and windy conditions was decidedly unpleasant, but being invited for tea in the 500 year old house (surrounded by a moat dating back to Norman times), proved to be ample compensation. Even now John Ikking finds it hard to believe that the ducks and the solitary swan managed to walk on the frozen over areas of the moat, “barefoot”! The various bits and pieces were again manhandled into a truck, and G-AWFM then set off on its penultimate journey, to Heathrow by road. By 14h00 on Saturday 10 February 1979 it was stored at British Airways’ Heathrow Cargo Centre having been off-loaded in record time (with the help of two fork-lift units). 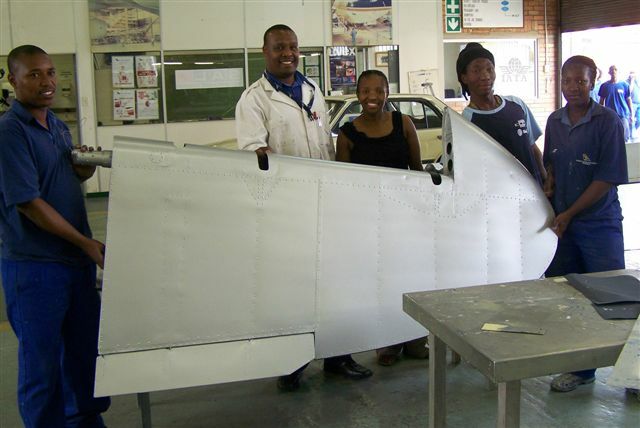 The redelivery flight was on ZS-SAM, with stops at Paris and Lisbon, and now G-AWFM is being re-assembled in the apprentice training hangar by a new generation of Airways personnel, the majority of whom were born after the aircraft had left South Africa on being sold by S. A. Airways. 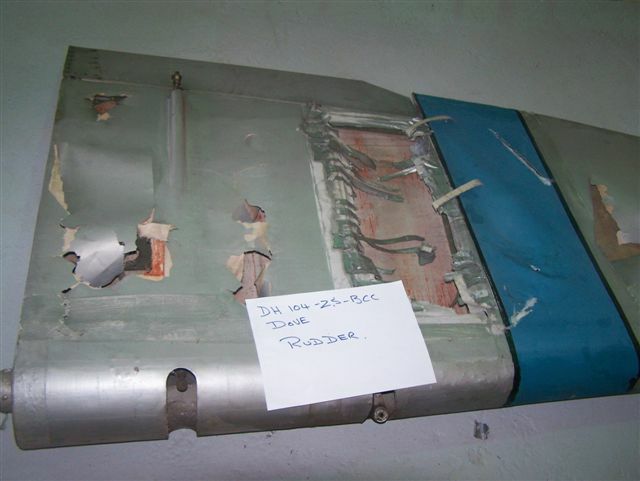 It is to be restored as ZS-BCC, and guidance, especially on interior detail, from those of you who worked on “Katberg” and “Naval Hill” at Rand and Palmietfontein, will be gratefully received. Any other interested persons are also welcome to visit the Training School. A final word of thanks is extended to Messrs. Mick Stroud and Philip Birtles of British Aerospace for arranging the storage at Salisbury Hall; Mr. Lobjoit and his staff for clearing the various items through Customs; Dave Becker of the SAAF Museum for the loan of their Dove manual; and finally Slim Howett and Jack Huber who so patiently and efficiently attended to countless telephonic and telex queries and made all necessary arrangements. 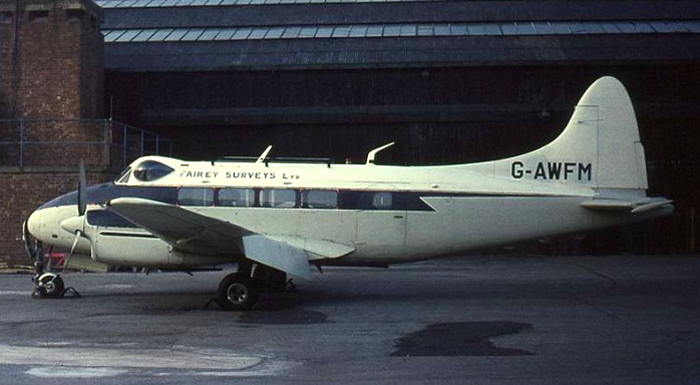 de Havilland Dove G-AWFM when in service with Fairey Surveys Ltd. In the background is the Lockheed Lodestar ZS-ASN as well as a Flamboyant Ax8-85 Hot Air Balloon ZS-HPI in SAA 50th Anniversary livery. Engines 2 x de Havilland Gipsy Queen 70-3, inverted 6 cylinder, air-cooled in-line producing 246 KW 330 HP driving de Havilland Hydromatic 3 bladed reversible pitch propellers. 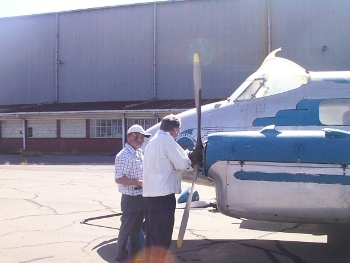 Then outside Rand Airport terminal after reassembly and some restoration work in late 2004. 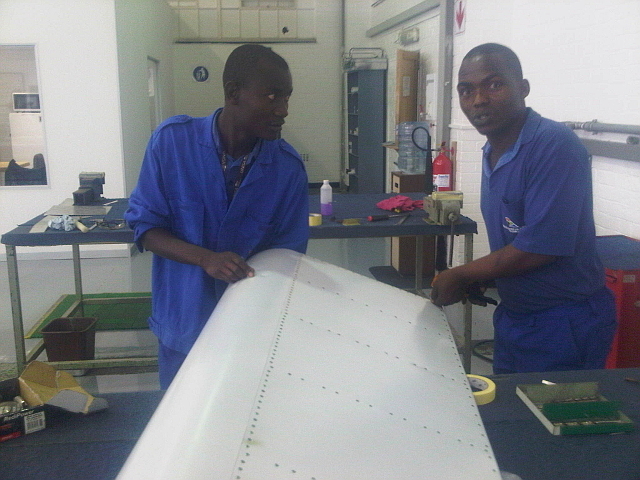 SAA Apprentice School personnel restore the Dove's control surfaces. 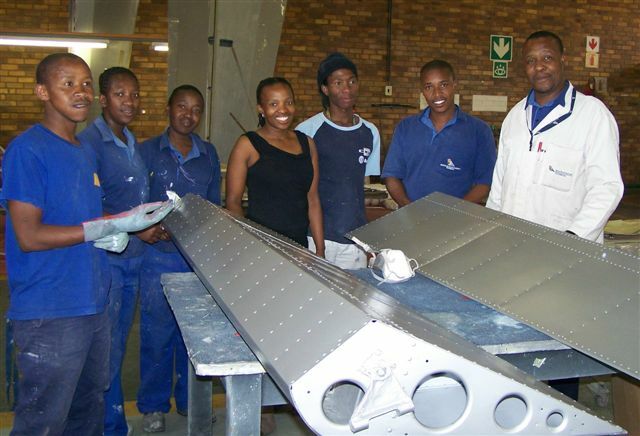 The SAA Museum Society has a wonderful relationship with South African Airways Technical and the South African Airways Apprentice School. 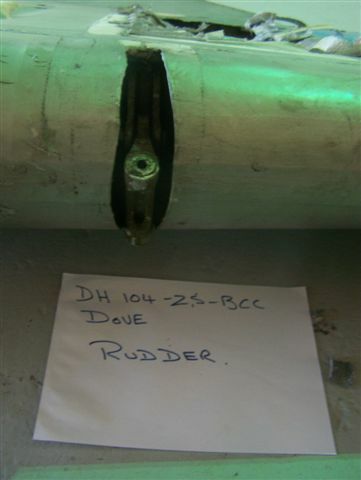 During August and September 2010 a number of apprentices journeyed to the Museum to remove the tatty control surfaces off the Dove. The pictures below show the before and after stages of restoration.